The same data as in Figure 1, viewed as a movie (left panel). The optical is color-coded on a heat scale: black represents low fluorescence intensity, white high fluorescence intensity. Since for this indicator fluorescence intensity increases with depolarization, white represents a relatively depolarized state, black a relatively hyperpolarized state. 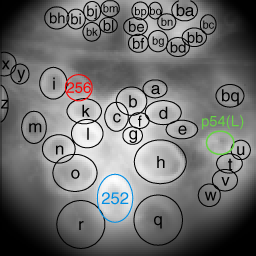 Cells 256, 252, and p54(L) are indicated by the red, blue, and green arrows, respectively. Figure 1C is reproduced here (right panel) for comparison. This movie was generated by first extracting an optical F/F signal for each cell, as shown in Figure 1D, using the manually drawn ellipses. We then lowpass filtered (2 Hz cutoff, zero-phase tenth-order Butterworth filter) each of these signals because the high-frequency components have large contributions from shot noise and are visually distracting. We then rectified each signal (i.e. set negative parts of the signal to zero) because this makes it easier to see the depolarized part of each cell’s signal. We constructed each frame of the movie as a mosaic of the cell ellipses, where the color of each ellipse was determined by the cell’s rectified lowpass-filtered F/F signal level at that time. The audio track represents the voltage recorded on the electrode in Tr2. We drove Tr2 with bursts of current pulses, and each pulse elicited a spike (Figure 1D, Tr2 trace). We delayed this signal by 150 ms, the approximate spike latency between the head brain and ganglion 10, to make it easier to match Tr2 bursts to the corresponding depolarizations in the target cells. A few pragmatic comments: First, the volume is rather low—you may need to turn up your speakers. Second, you’ll notice that there’s a lot of all-over activity, even in non-target cells. But if you focus on cell 256, you’ll see that it reliably depolarizes following each Tr2 burst. The effect is strongest for cell 256, less strong (but still present) for cell 252, and difficult to make out in cell p54(L). If you similarly focus on a non-target cell, any depolarizations in that cell will not be strongly locked to the Tr2 bursts.